In the last Study, we focused on how the work of the early church put a high value on glorifying God among all nations. This time, we will see how Paul also placed an emphasis on glorifying God – revealing or demonstrating His nature and character — among all people groups in the world. Paul lived much of his life as a Pharisee … the Hebrew of Hebrews (Phil. 3:5-6). In fact, he fought against the spread of the gospel and was even present at the first recorded Christian martyrdom (Acts 7:58). But after Jesus appeared to him on the road to Damascus, ­he converted and began an incredibly fruitful ministry whose main focus was on Gentiles and those in groups that had not yet heard. Is it a mere coincidence that the man who converted after a miraculous encounter with Jesus, the man whom God used to pen more books of the New Testament than anyone else, focused the vast majority of his ministry on the Gentiles? Or is it more likely that reaching all nations is something that is at the very heart of God? In this passage, after quoting four different scriptures that talk about God being glorified among all the Gentiles, Paul goes on to say how he had “fully proclaimed” or “fulfilled” the gospel in the areas where he had been, and that he always tried to preach the gospel where it had not been heard so that those who had not seen or heard would know (vv. 18-21). Let’s think about this for a minute. When Paul left each of the cities where he had ministered, was everyone in those cities a Christian? Well, no. So how could he say that he had fully proclaimed/fulfilled the gospel and be so eager to move on to new places when there was obviously still work that needed to be done within the churches and communities there? Paul viewed the task of spreading the gospel not only as a work to convert a lot of individuals, but as the work of redeeming people groups. He did not ignore the work of the church that needed to be done within already “reached” groups (as evidenced by his letters to the different churches), but his goal was to carry the gospel to groups that didn’t have any believers yet. One of the best things you can do to participate in God’s purpose to be glorified among all peoples is to WELCOME internationals who are currently living near you. You would be surprised at how many people from unreached people groups are in the United States for school or work. Being far away from home can open them up to receive the love and good news you have to offer through Christ. You can welcome these people by simply paying attention to who you bump into at work or the grocery store. You can also contact a local college to see if they are in need of conversation partners for their international students. This is not so different from loving your neighbor who is from the same culture as you are. Pray that the Lord would guide you and be willing to take a step of faith to start that conversation. The preceding is the ninth of twelve lessons. We started in Genesis and will be working our way through the Bible. These studies will be available on this website every other week starting July 15th, 2014. You can access them by going to Articles in SDBMissions.org. 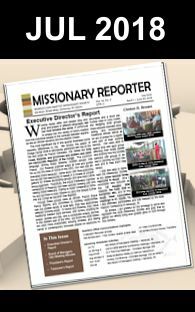 Or if you would like to receive these by email twice a month, please contact Subscribe by Email and say that you would like to be put on the missions study emails list or use our contact page: Contact Us. To download a powerpoint version follow this LINK.